Check that your Hugo version is minimum 0.30 with hugo version. We assume that all changes to Hugo content and customizations are going to be tracked by git (GitHub, Bitbucket etc.). Develop locally, build on remote system. 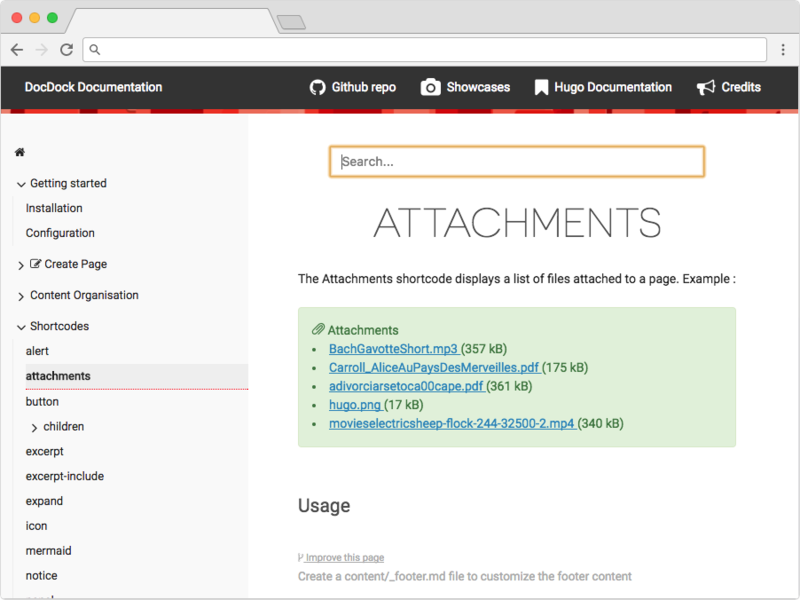 Navigate to your themes folder in your Hugo site and use perform one of following scenarios. DocDock will be added like a dependency repo to original project. When using CI tools like Netlify, Jenkins etc., submodule method is required, or you will get theme not found issues. Same applies when building site on remote server trough SSH. If submodule is no-go, use 3rd option. Now you are ready to add content and customize looks. Do not change any file inside theme directory. If you want to freeze changes to DocDock theme itself and use still submodules, fork private copy of DocDock and use that as submodule. When you are ready to update theme, just pull changes from origin to your private fork. This method results that files are checked out locally, but won’t be visible from parent git repo. Probably you will build site locally with hugo command and use result from public/ on your own. All files from theme will be tracked inside parent repo, to update it, have to override files in theme. Download following zip and extract inside themes/. Name of theme in next step will be hugo-theme-docdock-master, can rename as you wish. Import sample config from sample site to Hugo root.